A Mod for the Fender Blues Jr. These pages contain detailed directions to make the unused triode section in a Blues Jr. into a cathode follower buffer for the tone stack. Note that I have the "blonde" version, but the normal black Tolex version is the same inside. 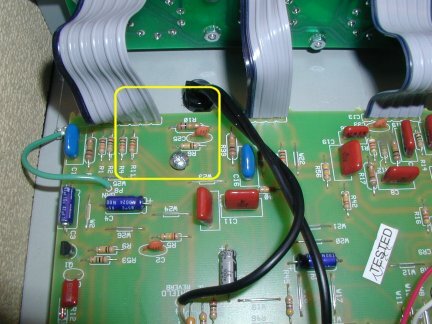 I have learned since first posting these pages that Fender has revised the circuit many times already, changing values here and there, and in some cases making substantial circuit changes. 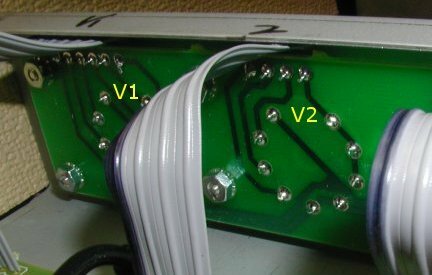 Specifically, the older printed ciruit boards (PCBs) were green in color like the ones shown here, while the more recent ones have cream-colored PCBs. Compare your schematic to the fragments posted further along to make sure they're basically the same. My amp is Revision D, plotted 12-Apr-99. The revision of your Blues Jr. is printed in the lower right corner of the schematic that comes with it. Please see also Bill Machrone's excellent Blues Junior Modification Pages for lots of useful info and product! - The chassis dimensions are 6.25 x 16.3125 (16 5/16) x 2 (HWD in inches). - The cabinet dimensions are 16.25 x 18 x 8.75 (top, 9.75 bottom) (HWD in inches). - The chassis cutout is 12.5 x 2.125 with a 0.75" radius at the corners. - The speaker is mounted as far to the right and bottom as possible (when viewed from the front). This mod is easy to do (and easy to undo if you don't like it) for anyone who is experienced with a soldering iron. All you need are three short lengths of wire and two 1/2 watt 100K resistors. I managed to do it in an evening (including taking pictures) without even removing the printed circuit boards (PCBs) from the chassis! Note: YOU CAN GET KILLED by fooling around with the high voltages in a tube amp. Don't even attempt this mod unless you have at least some experience and are pretty sure you know what you're doing! I quite like the Blues Jr. out of the box, it's light to carry (31 lbs.) and sounds decent. But I'm an eternal fiddler, and never leave well enough alone. By far the most important change I made to date was to replace the stock cheapo Fender/Eminence speaker with an aftermarket replacement (in this case, a Weber 12F125A) - what a huge difference! It has a loud, punchy sound, crisp when clean and nicely crunchy when cranked. Of course, this speaker cost a quarter of what I paid for the amp new, so this is not a low-budget change. The rest of this page is on the cheap. Remember, cutting and soldering will certainly void your warranty! Any modifications to an amp may also decrease its long-term reliability. 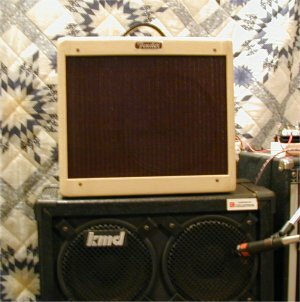 Many really old Fenders (pre-BF) and most Marshalls use a common cathode stage before the tone stack so that the stack does not "load down" the previous gain stage. This extra stage does not provide any (voltage) gain itself, but by decreasing the load on the previous stage, it increases the overall gain a bit. It also slightly changes the frequency response and therefore the tonal character. All pictures and descriptions (up, down, left, right) are with the amp on its face with the controls closest to you. Several inches of hookup wire, with 300V or better insulation. A basic meter or continuity tester to check connections when you're done. A soldering iron and solder and experience using them! The "tube PCB" is the long thin one the tubes plug into. The "main PCB" is the one that has all the rest of the parts. We'll be working on the top left end of both of them.